Our chapter maintains strong, active outreach in the San Diego community, and encourages both veterans and non-veteran associate members to join us. To fulfill our statement of purpose, we work with others in the community to increase public awareness to the overall costs of war, restrain our government from intervening in the internal affairs of other nations, seek justice for our fellow veterans and other victims of war, and work to end the use of nuclear weapons and war in general as instruments of our foreign policy. To accomplish these goals, we regularly participate in Arlington West Memorials around San Diego, we advocate for peace and alternatives to war by bannering along freeways, we visit annually with each of the five congressmen/women here in San Diego, and we maintain an active Compassion Campaign to provide sleeping bags sets to the homeless, many of whom are veterans, in downtown San Diego. We feel empowered by our success in each of these areas, and have, we feel, been successful in changing the mindset of many local San Diegans. In addition to the annual planned events above, we participate in special peace and social justice based events hosted by the San Diego Coalition for Peace and Justice (SDCPJ), the Peace Resource Center (PRC), the Friends Center, and events that we plan and host, as national and international events develop during the year. Speakers: We provide chapter member speakers to local veterans groups, political clubs, college classes and college events, who talk about our mission and effort to foster peace and social justice in San Diego. Veterans, and especially combat veterans, speak with special authority, and will often be listened to and accepted by those of differing political ideologies. Occupy San Diego: Since we believe that many aspects of the “Occupy” movement dovetail with those of our organization (opposition to the Military-Industrial complex, and ending war as an instrument of national policy), chapter members are involved with Occupy San Diego and provide advice and practical assistance to the informal leadership of the Occupy participants. Since the beginning of Occupy San Diego, chapter members have been involved in the support, planning, and execution of Occupy events, and on the occasion served as a buffer between the Occupy participants and the San Diego police. Chapter veterans have put on educational presentations, taken home and washed/dried loads of wet rain-soaked laundry, and counseled young informal leaders of Occupy. Additionally, Occupy participants have marched with us in parades and participate in events. 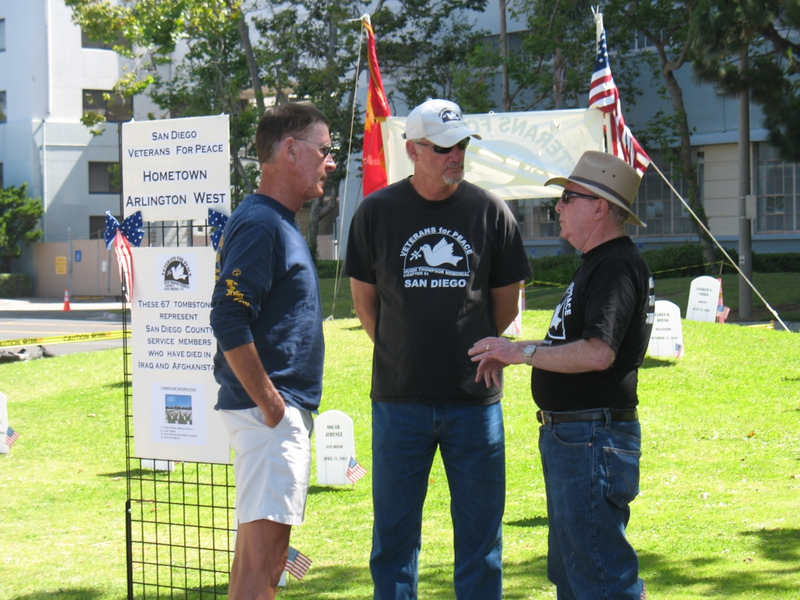 United Veterans Council: Each month, we send representatives to the United Veterans Council (UVC) at the Veterans Museum in Balboa Park and “pitch” our ongoing activities to our fellow vets. The UVC is made up of 80 different diverse veterans groups here in San Diego, and sometimes gets involved in local politics. During the 2008 presidential campaign, chapter veterans went down and stood outside the Veterans Museum with large banners as one of the major candidates and his supporters used the facility to extoll the virtues of the Iraq and Afghanistan wars, while having voted to cut benefits to returning veterans. We felt required to do this and received local press coverage as a result. Iraq and Afghanistan War anniversary events: We both plan and participate in memorials and anniversary protests concerning the ongoing wars in Iraq and Afghanistan dating back to 2003. These annual events can be quite very emotional to those involved, and our status as veterans has provided the peace community participants with both emotional and physical support, especially in the early years of both conflicts. Veterans, families of veterans, and the general public regularly tell us how much these events mean to those who have vets serving, as well as those who have lost family members in conflict. Learn more about our mission and join us.